Poison Ivy, the iconic botanical biochemist from the Batman series, cares deeply about protecting the lives of plants — by any means necessary. Her outfit revolves around plant life and includes shades of green as well as leaves and vines. A do-it-yourself Poison Ivy Halloween costume can be as simple or elaborate as you like. The base of Poison Ivy’s outfit has changed throughout the years, with her original outfit consisting of a green teddy-like bodysuit with hosiery. Corsets and full bodysuits in shades of green have also been worn by the villainess in both her comic book and movie form. No matter what base you choose for your Poison Ivy costume, green leaves -- and maybe a vine or two -- should be the central theme. Sew fake leaves on the desired base, or attach them with tacky glue. The placement of the leaves depends on your personal preference. If you are using a corset, you can either sew the fake leaves over the entire front of the corset or simply attach them to the edges. If you want a costume that is a bit less revealing, a green dress decorated in the same manner will work well. 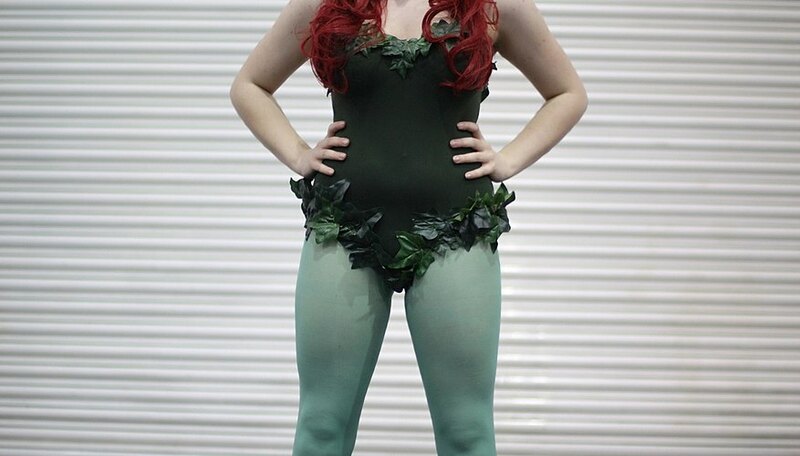 The pantyhose or tights worn by Poison Ivy are usually a different shade of green than the base of the outfit. For example, if the base of the outfit is a true green or a bit lighter, use tights that are a darker shade, such as forest or hunter green. If, however, the base is a darker green, use a lighter shade of green for the tights. Poison Ivy doesn’t always wear gloves, so they’re not necessary to the costume. If you would prefer wearing gloves, choose a pair in the same shade of green as the hosiery or base of the costume. The length of the gloves can vary but should reach at least the middle of the arm. Another option is to forgo the gloves and instead wrap leaf-covered vines around the arms. The footwear for Poison Ivy can be green, black or red high heels or even a pair of knee-high boots. If boots are what you are going for, consider gluing some fake leaves on the boots and then spraying the entire footwear with glittery green spray paint. Poison Ivy’s makeup varies throughout the comics, cartoons and movies. Eye shadows in shades of green, however, are generally necessary to complete the outfit. Furthermore, since Poison Ivy’s kiss is deadly, you could cover the lips with lipstick in shades of red or green. An alternative option is to attach fake ivy leaves to an inexpensive cat-eye mask with tacky glue and wear that instead of applying eye makeup. Poison Ivy’s fiery red hair varies from one generation to the next. In the older comics, her red shoulder-length hair wasn’t nearly as bright as it is now. In recent years, Poison Ivy’s hair has become noticeably redder and longer, stopping around the middle of her back. You can get the same look by donning a bright red wig. Her hairstyle is also rather simple, with full-bodied straight or wavy locks.